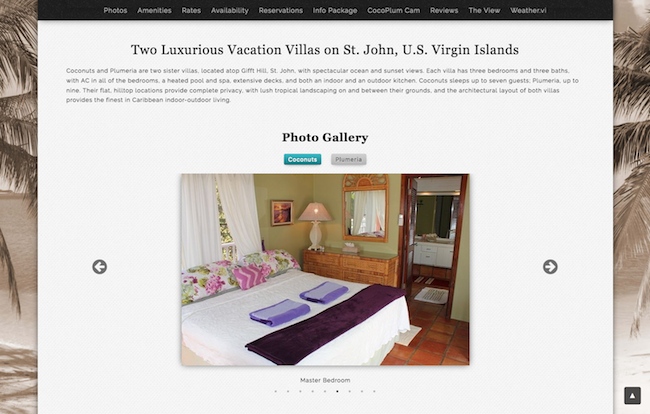 The CocoPlum.vi website features rental properties located on the US Virgin Islands. The header is actually the view from the property… beautiful! We implemented the reservation calendars for both properties, which allows site visitors to see when the properties are actually available. And you can book your reservation online… either on the CocoPlum.vi website, or via VRBO, which is a vacation property rental website. The site also features a web cam which points away from the living quarters and instead features the beautiful view of the ocean.